embrace my space | love what you have. have what you love. WELCOME FRIENDS! Today I’m talking about pineapples. Of course they are delicious when crushed up and mixed with tequila, but did you know that pineapples are an American symbol of hospitality? The use of the pineapple as a sign of welcome dates back to Colonial times. As legend has it, Christopher Columbus first encountered pineapples on the island of Guadaloupe. From then on, ships would return to the Colonies after Caribbean voyages hauling, among other things (rum! ), pineapples. Apparently, the captain would spear a pineapple on a fence post outside his home letting friends know he had returned from his voyage and that all were welcome to visit for food, drink and Caribbean tales. This began the tradition of innkeepers using pineapples in their advertisements and signage, which then led to the practice being used in homes. 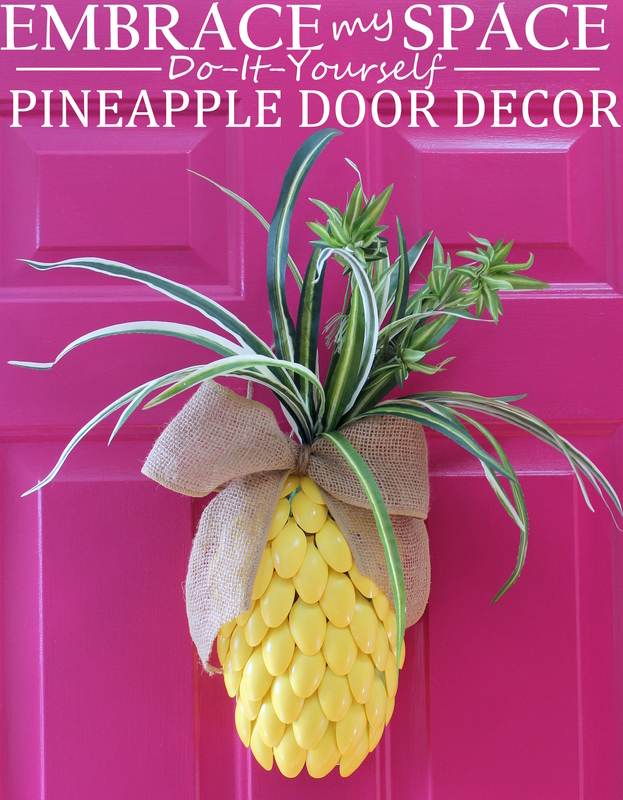 See this page for more on the history of the pineapple, because I’m here to talk DIY! Everyone, including me 90% of the time, has a wreath on their front door. This season I decided to mix it up with a pineapple. Of course, when the occasion calls for it, I like to make things myself. Here is a list of things I used to make my cute pineapple. 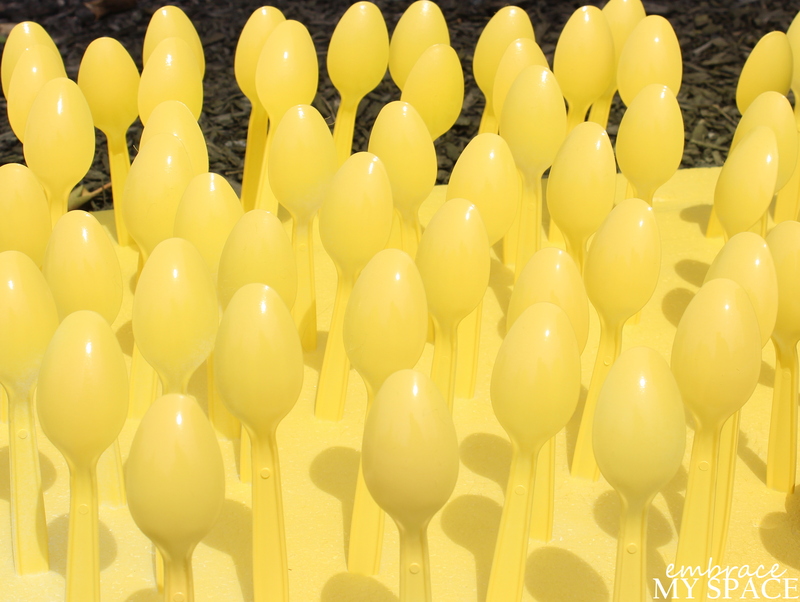 First, I sprayed white plastic spoons with two thin coats of Sun Yellow Rustoleum spray paint. Before spraying, I stuck each spoon into a piece of Styrofoam packing material I had left over. This made spraying easy. You shouldn’t have any issues laying the spoons flat to spray them, but I thought standing them up would make it easier to get coverage around the sides of the spoons. Don’t they look like little Minions all lined up like this? While your spoons are drying, cut your 3 liter bottle in half (lengthwise) using a pair of scissors. You can cut off the bottom of the bottle completely (the part with the little feet), but leave a bit of the bottle neck so there is a place to attach your pineapple stem. For the tougher plastic across the top of the bottle I used a serrated kitchen knife to saw through it. Once I had a nice opening, I used my scissors to cut through the rest. After they dried, I cut the handle off each spoon using hand-held pruning shears. A strong pair of scissors would do the trick as well. If you don’t have either, you can certainly bend the spoons to break off the handles. I would be extremely careful if you do it this way because little shards of plastic could fly when you break your spoon. I’d wear gloves and safety glasses to be doubly safe. You will want to leave about half an inch of the spoon handle so there is a nice flat area to glue to the bottle. If you look at my picture below, some of my spoon handles were a bit too short. This made it difficult to glue those spoons to the bottle. Using a bigger glob of glue helped. Glue your spoons to your plastic bottle starting from the bottom (I used hot glue). For your very first row make sure your spoons touch each other on the sides. As you go up your bottle row-by-row, you will need to spread your spoons a bit further apart so the spoons in the rows beneath poke through. Just make sure you are covering the plastic bottle underneath so you don’t have any “holes” in your pineapple when it’s all finished. Keeping the tip of your spoons lined up as you glue on each row creates nice layers. Spreading your plastic bottle over a large can turned on its side (think a big can of crushed tomatoes) helps to keep the shape of your bottle while you’re gluing on each row. 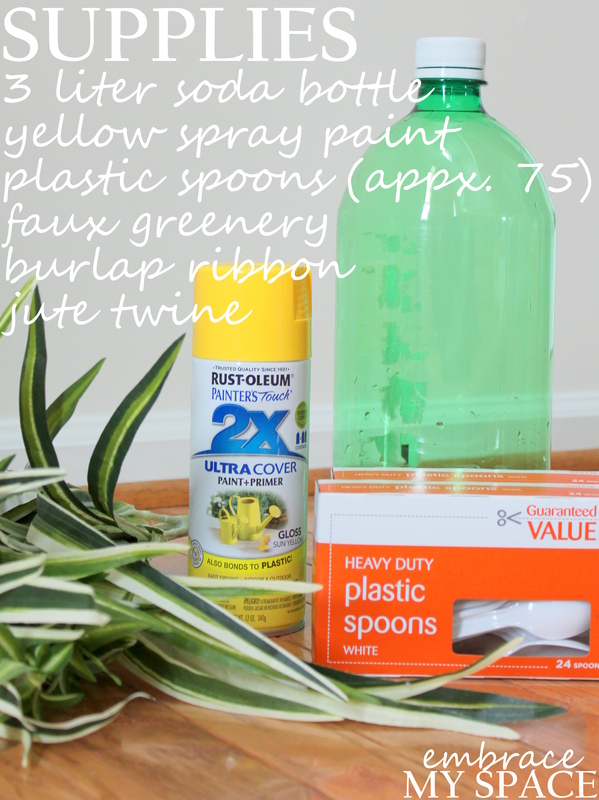 After you’ve covered the entire bottle with spoons, glue your faux greenery to the inside neck of your plastic bottle. I bought a faux spider plant from my local craft store that was full enough that I only needed to use half of it for my pineapple. Finally, I made a bow out of wide burlap ribbon and attached it to the pineapple by wrapping it around the bottom of the stem with some jute twine. You could use any ribbon you like or none at all, but it is nice to have something to finish off the area between the spoons and the stem because otherwise there is a weird little gap there. 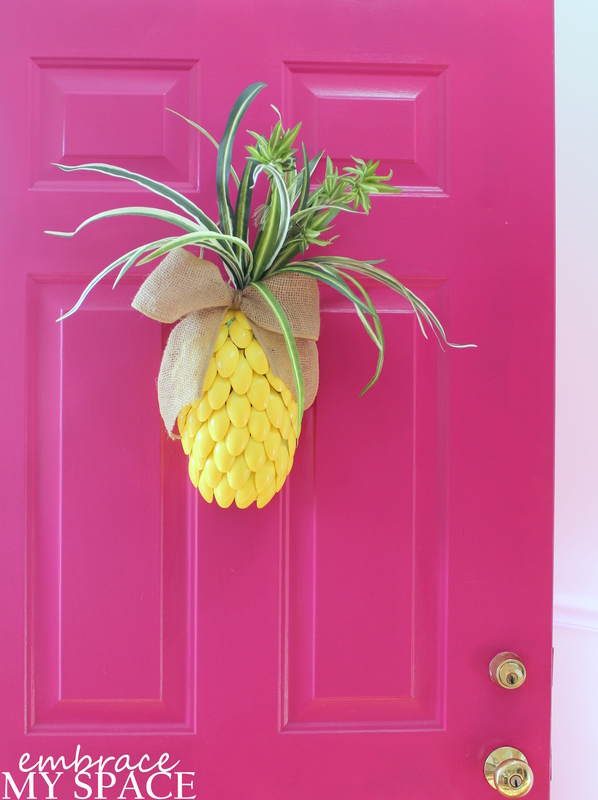 I made a loop out of jute twine and tied it to the back of the stem so I had a way to hang the pineapple on my door. 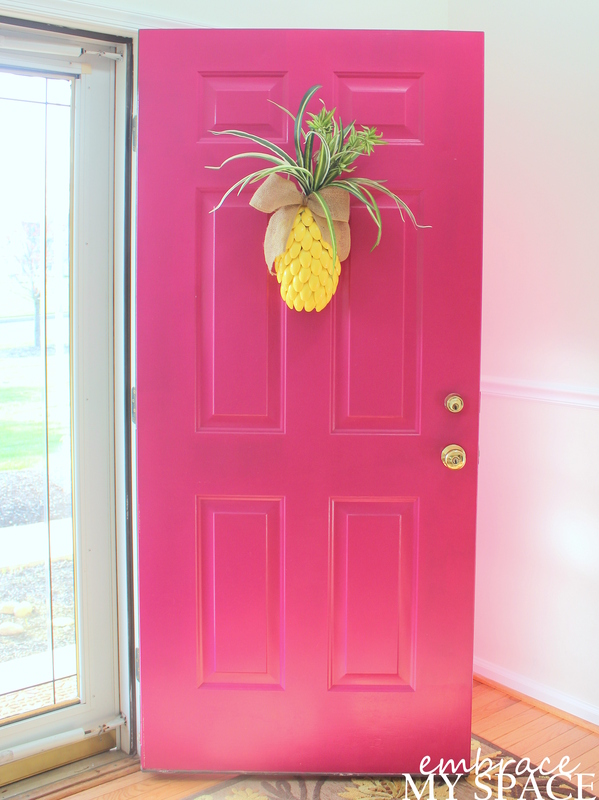 I love how bright and fresh the pineapple looks on my front door. Do you think you’ll try this one? I think it’s a totally cute substitute for a regular old wreath. It’s also cheap and really easy to make! If you’re like me and always go to your craft store with 50% coupons in hand, you can make this little guy for under $10. 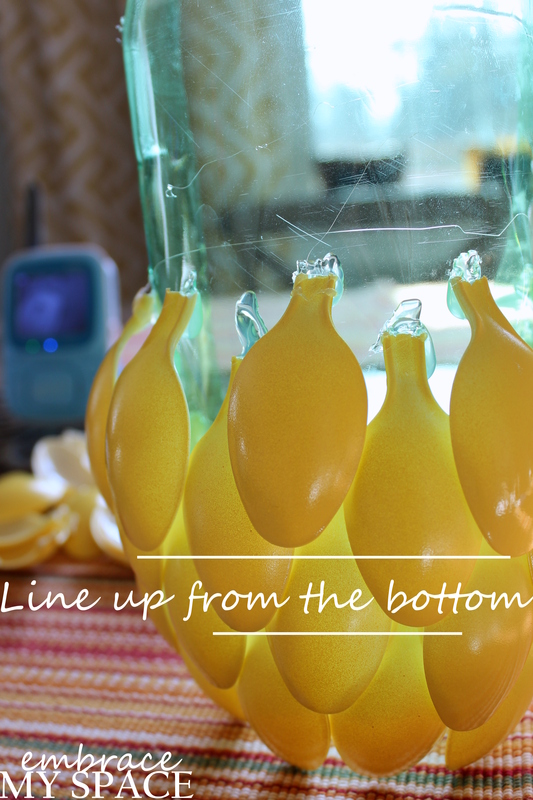 And, since your bottle will have two halves, split the cost of supplies with a friend and make an afternoon out of it! A Chic Easter Banner for a Buck! How to Make Your Bathroom Beautiful Using Color!